The PADI Scuba Diver course in Padang Bai is the perfect way to get your first steps in scuba diving on a short 2-day itinerary. 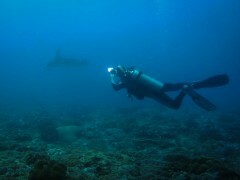 You'll begin with theory lessons on the basic skills and techniques of diving, such as handling the scuba mask and breathing under the water. You’ll also get to practice these skills in the swimming pool, before your big day of diving in the open ocean. When you're ready, you'll complete two open water dives, swimming as deep as 40 feet in the beautiful Bali Sea. You'll view multi-coloured, natural corals and spot colourful fishes swimming past you. A certified dive instructor will guide and train you through every step of the course. Padang Bai, a small coastal town 1-hr drive away from Bali, is home to gorgeous, shallow reefs. The dive sites, located a few minutes of boat ride from the dive center, feature a range of different species of fish, including sweetlips, eels, turtles, lionfish, octopus, cuttlefish, scorpionfish and even black tip and nurse sharks. The terrain is lined with a range of different hard and soft corals, with huge boomies and feather stars. With fairly good visibility conditions of around 80 feet and a mild ocean current, the dive sites of Padang Bai are a great location for trainee as well as seasoned divers. 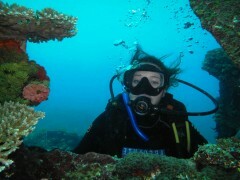 • Learn basic skills and techniques of scuba diving on 2-day itinerary. • Earn your PADI Scuba Diver certification at Padang Bai. Report at the dive center in Padang Bai by early morning. You'll meet your dive instructor and begin the training for your course. The day's agenda includes theory sessions and pool training. You'll begin by reviewing theory modules, watching training videos and taking short quizzes. Each modules is associated with a corresponding practical session in the swimming pool. A certified dive instructor will get into the pool with you and teach you the use of scuba equipment along with diving skills and techniques. The day's session ends by late afternoon. You can spend the rest of the day at leisure. 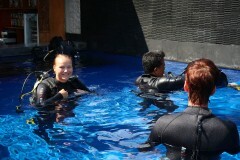 Become a certified PADI Scuba Diver with a 2-day diving course in Bali. Day 2 of the PADI Scuba Diver course in Padang Bai: 2 open water dives! Report at the dive center in Padang Bai by early morning. The day begins with a boat ride to a few of the dive sites around Padang Bai. En route, the dive instructor will continue to brief you regarding the basic pointers that you'll need to keep in mind while diving. Over the course of the day, you'll complete two open water dives. During these dives, you will continue practicing several breathing and navigation skills that you learnt in the swimming pool yesterday. Lunch is served on the boat between the two dives. The day's session ends as the boat returns back to the dive center. Your trip ends here. Complete the theory and pool training section of your scuba diving course. Lunch is served by noon. The day's session ends by late afternoon. Your course ends by late afternoon. Complete two open water dives in the Bali Sea. Lunch is served on the boat between the two dives. The day's session ends by late afternoon.